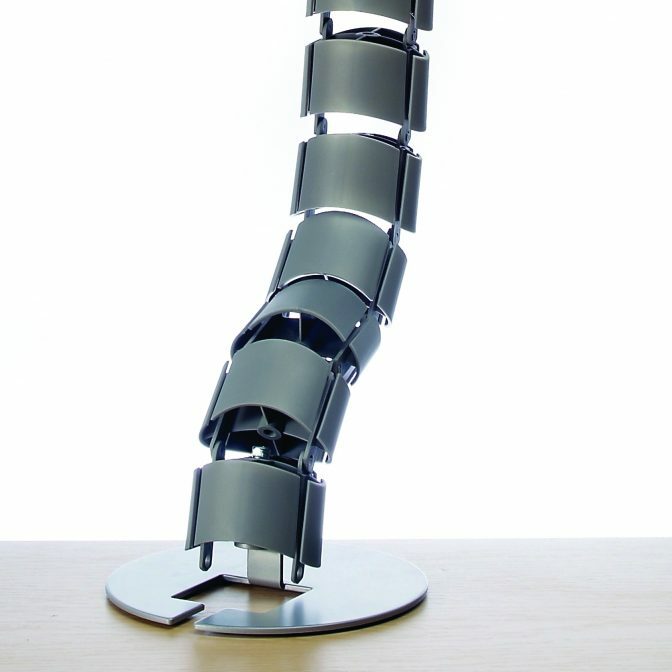 Effective cable management for your office furniture! Devon office furniture dealers MD Business Interiors of Exeter say cable management has always been an issue in the office environment. The variety of devices now used in the office place are unfortunately accompanied by wires and cables! Helping you work Faster, Tidier and Smarter is what we do. So read on to see the advantages of our Cable Management products! Our wire basket range provides a fantastic solution to help place all wires and cables neatly. They provide a sleek finish to the office desk but are also easy to install via their clamping mechanisms. Chrome finished baskets will help place all wires to reduce knots, prevent trip hazards and allow the end user to easy add, remove and change wires if required. Our wire baskets can be cut to a variety of sizes to fit any desk perfectly! Our cable spines have been designed to help organise all those cables and wires from the office desk to the power point. 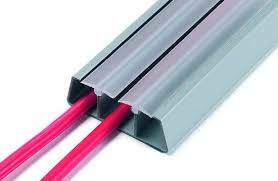 Our flexible plastic trunking allows cables to be placed free from damage and knots. Our cable spines come in 3 colours and are extremely easy to assemble! Our trunking comes with 3 compartments which provides a quick and easy solution to cable tiding. Our trunking is available in 3m lengths or cut to size and come in black and silver to match your office furniture. 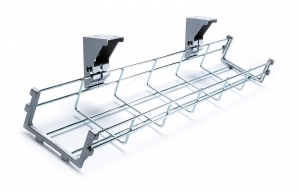 Our cable management products are designed fit your new or existing office furniture. It will help you work Faster, Tidier and Smarter. All products are designed with the highest quality material to have long lasting durability. If you would like more information on our products, give our sales team a call on 01392 834980. Helping you work Faster, Tidier and Smarter! By Mark Dowse|2019-02-26T14:20:53+01:00July 10th, 2018|Uncategorised|Comments Off on Effective cable management for your office furniture!